Instructors: Martin Holzke, LearnToProgram, Inc. I would thank for your tutorial Martin. It is nice not just for the beginner; but the experienced member as me. The SQL is based on my every-day work; therefore I found this tutorial so useful. Thank you again! Apparently there are sever courses with this name. I took this one: https://www.udemy.com/mssql-database-training/ which is taught by SAP Trainers at IT Intelligence Group. The reason that I didn't give it all four stars is because there often mistakes in the videos that the instructor would spend time correcting. It was fine at first, but for a paid course (though I got a 50% discount), I would expect a more polished course. As far as the topics covered, I felt like the instructor did a good job. As the title says, it is a beginners course, and therefor a good introduction for relational databases. Martin is thorough, doesn't rush anything and all is well explained. The perfect intro. My advice is to print off a copy of the relational diagram/chart as you will keep referring to it. This course was exactly what I was looking for: a quick, thorough introduction to SQL querying. In each lecture, instructor Martin Holzke tells you about an SQL feature, demonstrates how to write relevant queries, and shows you what the results are. The exercises then lead you through writing and executing your own, similar queries. Very nice approach, the teacher is gradually leading students from the simplest to pretty complex things, with a lot of details and practical explanations. This course is set up very well. It uses a small (easy understandable) database, to show in a structured manner, the features of SQL (from absolute beginning to more complex). The features are described using hands-on demonstration. I think this is a great course. It breaks down a lot of the material into small manageable sections and makes it easy for the learner to understand the concepts. When it comes to being introduced to any new topic, the more information and care taken to delivery information at the right time the better... This wasn't my first introduction to SQL, although it has been the best and is a great starting point. This course has helped me develop my knowledge from a brief introduction at University to a point where I would feel comfortable messing around with SQL alone, instead of with a friend who knows about SQL. If you have any interest in SQL and need a place to start, try this course. I knew zilch about SQL before I started this course. Candidly, after the first lesson, I was completely lost. I did do a little research (minimal overview of SQL) outside of this course and came back to it. This is the only complaint I have about this course; hopefully Martin will consider adding that in the future. I think this course is a great value and appreciate the material being perpetuity accessible. Martin’s instruction has taken a lady with no SQL skills what-so-ever to the SQL know-how lady. Thanks Martin! I have some experience with SQL and I thought the course was well structured and easy to follow. The material is presented well but the presenter can be hard to understand, especially at the end of sentences where he tends to get very soft. Fixing that is relatively easy and would make the course 5 stars in my opinion. Great information and very timely, SQL is a great skill to have. I enjoyed going through this course. It took a couple videos to get used to the instructors accent but it wasn't a major problem. The course is set up well and has a nice flow. 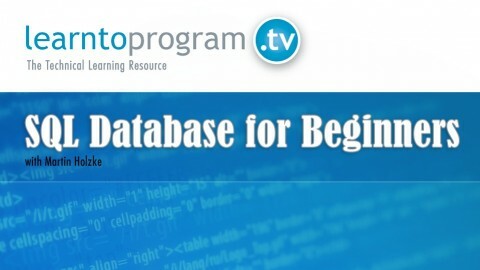 I look forward to more courses from learntoprogram.tv. Martin is very thorough in his explanations, and he smoothly moves from topic to topic within each lecture--which is something I wish more educators on Udemy would do. I signed up for this course as a refresher (I have a degree in the field that I've gone too long without using), but to my surprise I learned a few new things as well. I do think it would be wise to have at least some minor familiarity with software development if you want to get the most out of this course. Highly recommended. SQL Database for Beginners is not just for beginners. 1.There is a lots of information here with many materials for download. (Codes, Diagrams, Lab & etc…) 2.The course is well thought out & very well structured. It’s a course that someone has put lots of time & effort in it. 3.I really like the course, because Mr. Holzke explained the basic of SQL Database in an easy to follow method. 4.Unlike some Udemy courses, Mr. Holzke seems to respond student’s questions very promptly. When I started taking this course I was only able to perform very basic SQL tasks (i.e. Select queries, inserts, etc). After completing this course, I have a greater knowledge of not only database structures and queries, but also understand and can perform more complex tasks like creating stored procedures. I'm sure the information covered in this course is on par with similar classes of similar content. For a beginners class an instructor with a rhythmic and fluid teaching style would have been more appropriate. All the stop, start, pause, start again choppiness of the instructor's teaching style makes this course hard to follow at times for a beginner. I'm sticking to this class for the content but it's a forced stay. I have for some time struggled to understand the concept of joining tables, especially when joining more than two tables. Martin makes it look easy, and provides multiple ways to achieve the desired results. The course starts with very basic examples and works up to more complex real world scenarios. Each chapter ends with a lab exercise to consolidate understanding. If like me you struggle to understand SQL queries, you cannot go wrong with this course. This course was amazing. Before I started, I had no idea what an SQL Database even was and how you were supposed to use it. The instructor was great and answered questions I had along the way and the videos were simple and easy to follow. Love the chapter labs to help strengthen what you just learned. I would recommend this course in a heartbeat! I'm someone with a business background who always had ideas for startups but could never quite execute without the help of a "tech person". This was quite crippling until I found Udemy, Udacity and coursera. Slowly, I have begun building my skillset and reached the point where I needed to learn SQL. I have not finished the course yet, but this course is more comprehensive than the free ones on SQL and lives up to Learn to Program's standards they've established in other classes (I think this is the 4th class I signed up to from them). The class is not perfect and the professor's accent takes some getting used to but I found it to be a very accessible course for a beginner like myself and look forward to continuing my re-education.